A group of researchers from the Faculty of Physics at the University of Warsaw has just published the results of their works on miniature device - a tripler - for generating femtosecond laser pulses in the UV. Not only does the device has three times higher efficiency than previously used setups, but also fits on a finger tip, thanks to using a unique software package, developed in Warsaw, during the design stage. Although with new technologies lasers cover more and more spectral regions, some wavelengths are still not easily accessible. This includes the ultraviolet (UV) band around 300 nm, especially if short pulse durations and/or high intensities are needed. Often, UV pulses are generated via nonlinear processes such as second harmonic generation or sum frequency generation where new photons with higher energy and a new color are formed by summing up energy of the fundamental pulse photons. The efficiency of this processes, that allows near infrared laser pulses to be converted into UV is, however, very small. For many years, analytical light propagation models or simple numerical simulations were used to design frequency converters. They allowed scientists to tweak different device parameters, typically one at a time. This approach resulted in the conversion efficiencies from un-amplified infrared femtosecond lasers to the UV third harmonic to stagnate at around 10%. - It was like coming to the lab, tweaking one knob here, one knob there, while looking at the UV output power and trying to maximize it. And 10% is as good as one can get with this approach - says Michal Nejbauer, from the team of researchers based at the Faculty of Physics of the University of Warsaw, Poland. But increasing computational power available, combined with clever programming tricks allowed for the global optimization of the frequency conversion process from infrared to UV to be used for the first time. - Our newly developed, open-source simulation package - called Hussar - allows even an inexperienced user to build a complex, 3-dimensional, accurate simulations of multiple pulse propagation and interaction using simple blocks: input pulse parameters, material properties of the media and the processes involved - explains Tomasz Kardas, who developed the software - Once we define the input pulse parameters, such as energy, duration and spatial beam profile, we essentially start searching for the best design over a large space of parameters: the nonlinear crystal thicknesses, the beam size, the beam waist position, etc. And, to our surprise, once we found these optimum values, built the device and measured its performance, the output UV pulses were exactly as simulated. This kind of quantitative agreement between what one gets on the screen and then measures in the lab is rather uncommon in nonlinear optics. But increasing the tripling process efficiency by a factor of three, to above 30%, was just the first step. The researchers also aimed at miniaturization - rather than using multiple components mounted on the laboratory table, their third harmonic generator (tripler) is just a tiny block of crystals stacked together. - In fact, the 1-inch metal holder that keeps all the elements together is the biggest part of the whole setup - explains Pawel Wnuk , who took leading role in the device characterization experiments. As a result, the tripler prototype has the overall volume around 1000 times smaller than the traditional, previously used designs. The miniature frequency tripler was developed within the MINIMODS consortium, coordinated by Glasgow-based M Squared Lasers LTD, made up of industry partners Laseroptik (Germany), Radiant Light (Spain) and Time-Bandwidth Products (Switzerland). Research partners include the University of Warsaw (Poland) and the Fraunhofer Centre for Applied Photonics (UK). 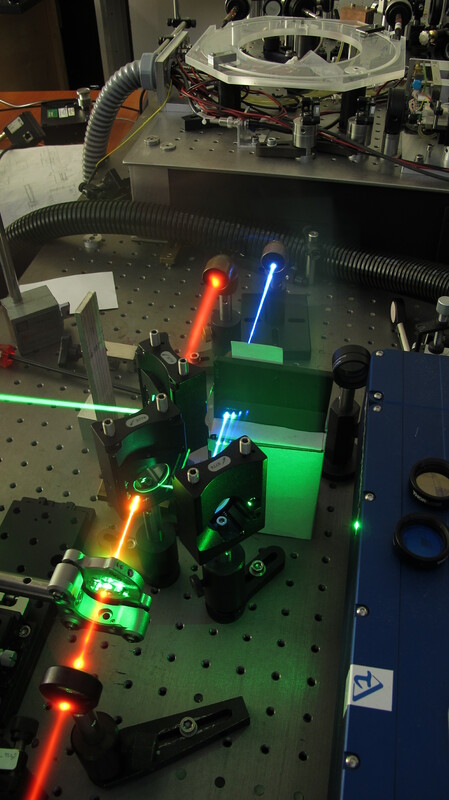 The project, running between 2013-2015 and supported through the EC's Seventh Framework Programme FP7-SME, aimed to address barriers to expansion and innovation within the photonics industry, with focus on creating cost-efficient, compact tools and devices for integration into laser systems. - Working in close collaboration with industrial partners was a new, interesting experience. We have learned a lot about how they approach research and product development - says Piotr Wasylczyk, who was the project principal investigator at the University of Warsaw. - I am not sure if they learned a lot from us, but the feedback we got from them on what we did and how was very positive. The tripler works results are published this week in Scientific Reports (22/02/2017).